Sidewall bulges can be difficult to diagnose. Sometimes it is even possible to misinterpret a depression as a bulge so lets start off today's lesson with clarifying the words. According to Dictionary.com bulge means a "rounded projection, bend, or protruding part; protuberance; hump". I think we can all agree that this is a sidewall bulge. A depression would be the opposite, or "sunken place or part; an area lower than the surrounding surface". Sometimes I may use the terms "Bulge in" and "bulge out"just to be sure people have a clear understanding. Look closely at this shot and I think you can see that this is a depression in the sidewall. Here are a couple of other shots showing sidewall depressions. 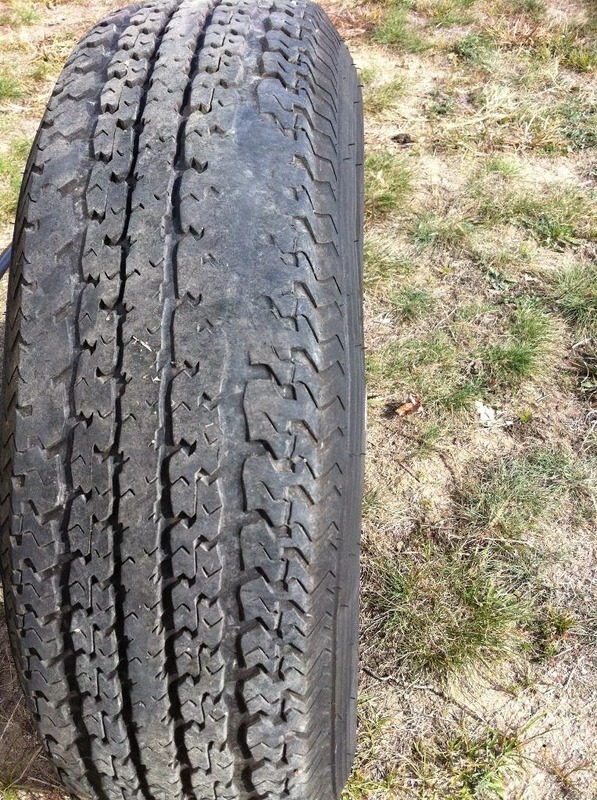 OK So now you are probably asking why are these two conditions in tires and are they defects or what? Lets step back for a moment and consider how tires are made. The basics apply to all tires, be they small 10" or 12" as seen on micro cars or 22.5 or even large mining tires like this one. In this post there are some links with videos showing the basic process of wrapping layers of fabric (or sometimes steel cord) that is in a sheet of rubber, around a drum. The place where the builder starts and stops has a "splice". Now the goal is to have a strong enough joint to keep the uncured rubber together till the tire is cured. In some constructions this means a small overlap of one to maybe 4 cords. If the overlap is larger than desired there is a doubling-up of the cord and this is what creates the depression. I know this is counter-intuitive but you need to remember that when a tire is inflated the rubber stretches and the textile cords stretch a slight bit. However if the splice is "heavy" or larger than desired the forces from inflation are resisted by twice the normal amount of cord and rubber so the stretch is less than in the rest of the tire. There is nothing wrong here other than a visual depression. Now a bulge is just the opposite. If the splice is "open" or there are cords missing then that area will stretch out more as there is only sidewall rubber resisting the air pressure so the sidewall stretches out just like a balloon. 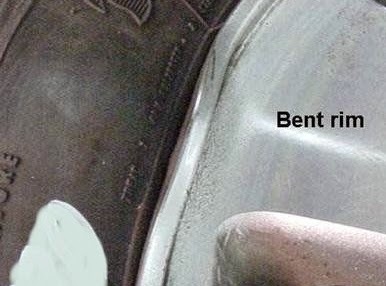 A bulge from an open splice is noticeable as soon as the tire is inflated. If you see this on a new tire point it out to the tire dealer right away and confirm the bulge is below the level of concern for that make of tire. This will probably be less than a tenth inch above the surface of the rest of the tire and less than 1/2" wide. If larger I would request a different tire unless the dealer is willing to put in writing that the tire is safe. Get a nice close picture of the tire for your records and be sure the bulge does not get any larger. The other thing that can cause a bulge is broken body cord from some sort of impact such as a curb, pothole or from hitting something on the road. Here are a couple shots of a 22.5 that suffered an impact. .One thing to point out how I know this was not a factory defect. 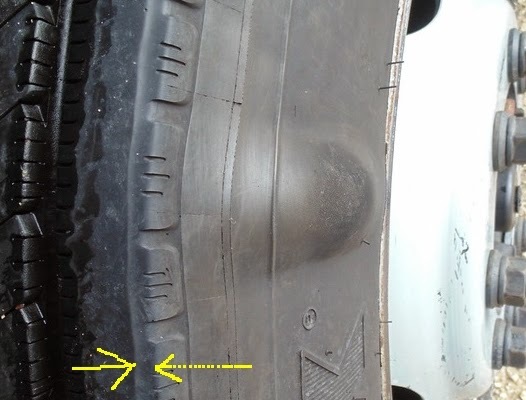 I have yellow arrows pointing to the small amount to irregular tread wear. You will note that this level of wear is fairly uniform around the tire. If the defect had been in the tire from when new I would expect the sidewall bulge to affect the tread wear. Since it didn't, that indicates to me the break of the body cord is recent. In case you are wondering what broken cord might look like here are a couple shots of broken Polyester cord from a smaller tire. .I hope everyone now understands the difference between a cosmetic depression and a bulge due to a tire impact. If you have a Bulge that looks anything like the examples above I would not drive on the tire. If we are talking about a high pressure tire (75 psi or higher) I would not even stand near the tire while waiting for service. A tire explosion can be damaging or even injure people. Synopsis: Dynamic Tire Corp. (Dynamic) is recalling certain Towmax STR tires, size ST225/75 R15 manufactured June 15, 2014, to October 14, 2014. The affected tires may have the Incorrect Load Capacity and Inflation Pressure Stampings. Thus, these vehicles fail to comply with the requirements of the Federal Motor Vehicle Safety Standards (FMVSS) 119. The misinformation on the label could lead a driver to over-inflate the tires. Tire over-inflation may increase the risk of a tire failure which can increase the risk of a crash. Dynamic will notify owners, and dealers will replace all eligible tires, free of charge. Owners may contact Dynamic customer service at 1-905-595-3593. The details are that 17,000+ Load Range D Towmax tires with DOT serial ADB4GPD2414 through ADB4GPD4214are subject to the recall and are to be replaced FREE of charge. One bit of information that many will skip over is the part where it says Dynamic will notify owners. While this is standard language in recall notices it overlooks a major problem. Just how is Dynamic supposed to know the owner's name & address? According to Federal law all DOT tires are supposed to be registered and that information is supposed to be entered in a big database to enable future contact in case of a recall. The problem is that according to various studies only about 17% of tires sold by dealers have the necessary registration forms completed and sent to the registration authority. Do you know if all your tires have been registered? If not then you will probably never know about a tire safety recall. Note this is not limited to Towmax brand tires but applies to all of your car, truck, trailer or motorhome tires. 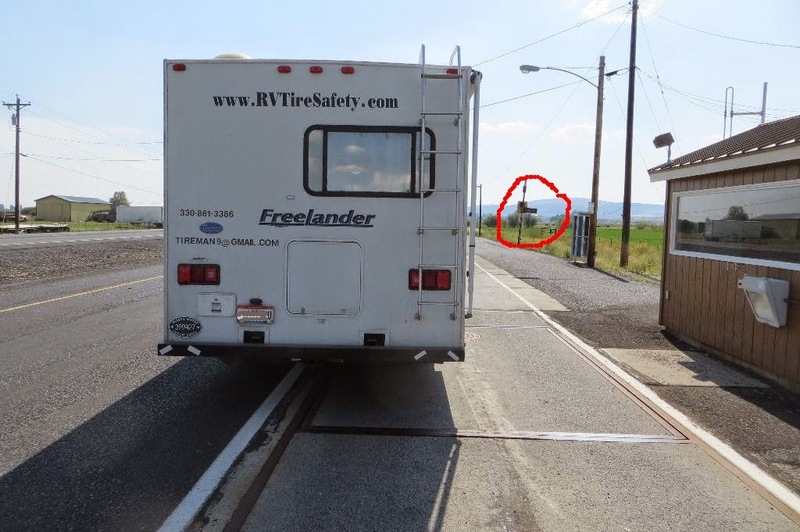 Confirm that your RV Dealership registered the tires on your trailer or motorhome. If you bought your car or truck new from the company dealer the tires are probably registered. You might start by asking what their policy is. You may find some confusion or hemming and hawing on the part of the dealer, I would take as indication that they did not do the task they are supposed to do by law. Car and truck dealers may do a better job but we all know what can happen if we "assume" someone is doing the job they are supposed to do.I would see nothing wrong with using the on-line registration process below,just to be sure. You can do the job yourself at TireRegistration.com or simply Google Tire registration and see if your tire brand has a sight just for registering your tires. Please don't be concerned that this is some "Big Brother" conspiracy. I have never heard of this information being used for any purpose other than notification of a recall. Finally if you have changed mailing address you might want to update the tire registration. Remember you will need the full DOT serial including the date codes for each tire. If in doubt on how to read your tire serial number, reviewing THIS post will help. I believe that sometimes people understand that there are suggestions and recommendations concerning the proper care and maintenance of tires but all too often they just don't bother to follow the published guidelines as they feel it may be too much work or some guidelines are simply put out to get people to buy more tires. Let's look at one example. I have previously covered the importance of "matching" dual tires by measuring the Outside Circumference (OC) and ensuring that each pair are within 3/4" for this measurement. You can read THIS post and THIS one for more details. But is this practice followed by truckers who may put 100,000 miles on their rigs in just a year or so? I think this might help you believe that the practice is followed. Here are a couple of pictures I was able to capture at a stop-light. 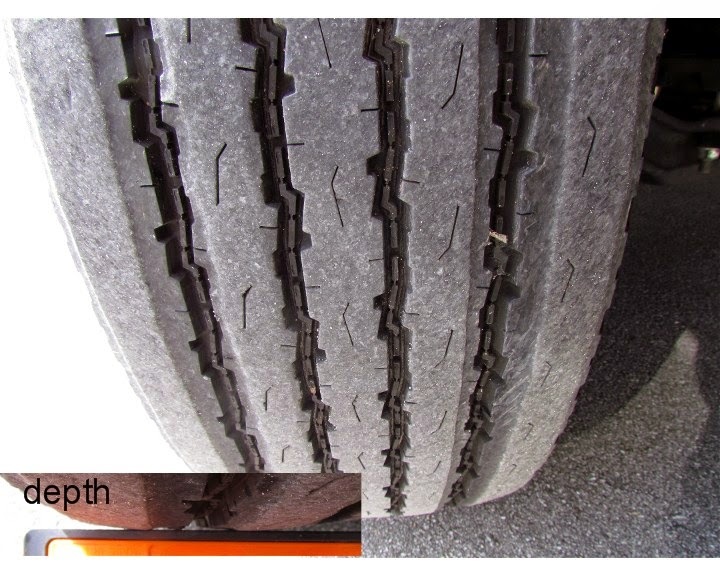 As you can see from these pictures, this driver has matched the level of wear on the front pair of tires. Now this isn't absolute proof that the OC was matched but given the relatively even wear rate of truck drive tires it's reasonable to assume the change in tread depth results in a similar change in OC. You want to match dual tire dimensions as if one tire is significantly larger than the other it will be forced to carry more load than the smaller tire. This will result in higher operating temperature which is not good for long-term tire life. While measuring tread depth and doing some calculations may seem reasonable this practice ignores the reality that all tires "grow" in use so a new tire and old used tire will actually measure different if you do an actual OC measurement than if you just do calculations based on tread depth measurement done to the 0.01" accuracy. Based on posts I see on various RV forums it appears that some RV owners are having difficulty finding the appropriate technical information on their tires. As a result sometimes they post questions such as "I have a XYZ RV with ABC brand tires what is the correct inflation for my tires". If you are a frequent reader of this blog I trust you can see that much critical information is missing and any answer that says "Use QQ psi because that is what I use on my RV" is not much better than a wild guess. I have decided to assemble links to tire Load & Inflation tables for the "major" brands of tires likely to be found on RVs. Now I know that there are many tires out there that are not made by or for the major tire manufacturers that have been selected by the company that assembled some RVs so this is not a list of each and every tire out there. If you have a tire not identified from one of the manufacturers I have listed, please send an email (address posted in the About Roger info on right side of this blog) and I will endeavor to update this list. Unlike most blog posts I plan on updating this post when new or additional information becomes available so you might want to Bookmark this page to your list of Favorites. Note: I will use the term "TBR" for Truck Bus Radial and this in general means tires with 17.5, 19.5 and 22.5 rim diameter. "LT" of course means Light Truck and "ST" stands for Special Trailer. "P" or Passenger type tires would only be on passenger vehicles or very small trailer. Sometimes it is difficult to know who actually made your tires. I have seen tires with the brand name "GT" which is obviously not the name of a tire company but simply a name used for marketing a line of tires. If you do not know who or where your tires were made HERE is a web site that will allow you to use the first two characters of the DOT serial molded on the tire sidewall to learn the facts. For example if the DOT serial on your tire was 4DHLABC4513 you would look uo the "4D" and discover the tire company to be BRIDGESTONE/FIRESTONE NORTH AMERICAN TIRE, LLC. and the plant location to be Morrison Tennessee, USA, with a manufacturing date of 45th week 2013 or the week of Nov 3 2013. If the first two characters were 4V you would discover the tire company was actually CHONCHE AUTO DOUBLE HAPPINESS TYRE CORP., LTD, TAIYUAN CITY, SHANXI, China. While this company does not appear to actively market to RV owners they do have tires that will fit and work on many types of RVs that use LT or TBR type tires. This web page has general information on RV applications and a "how to guide" to help RV, travel trailer, mini-bus, van, light truck and ambulance owners learn how to properly weigh their vehicles and maintain their tires". The page also has a worksheet to help owners to properly weigh and calculate the correct minimum inflation needed for their unit. Much of the information on the web site is general in nature so is of value to many RV owners. Here is the Load Inflation chart in download PDF format for RV size tires made by Bridgestone. This brand is sold and serviced through both company stores and independent dealers. This company has a line of smaller "commercial" tires based on European designs aimed at the Utility/Van market in addition to both LT and larger TBR size tires, Some of these tires might fit trailers including larger 5th wheel trailers and come in 14", 15" & 16" rim diameter. NOTE these tires have sizes like 225/70R15C LR-D. The "C" after the rim diameter stands for "Commercial" and is a European background. Do not confuse these commercial tires with LT type. The sizes may be similar but the loads, inflation and even some of the dimensions are different. TBR size Load Inflation tables starting with 17.5" diameter can be found here. Dunlop is a subsidiary of Goodyear Tire & Rubber Co. They have a selection of LT type tires. This brand is sold and services through both Goodyear company stores and independent dealers. I could not find Load/Inflation tables specific to Dunlop but would expect that the Goodyear charts should line up 100%. Firestone is a subsidiary of Bridgestone Tire Co.
Like their parent company, Firestone does not actively market to RV owners. They do have their own line of LT and TBR type tires. You can download their Data Book HERE. This contains technical on both current and many discontinued tire lines along with numerous pages of tire, wheel and vehicle technical and safety related information. Load / Inflation tables for Firestone brand tires can be found in both the Data Book and downloaded separately HERE. They also have a page of general tire information and links HERE. 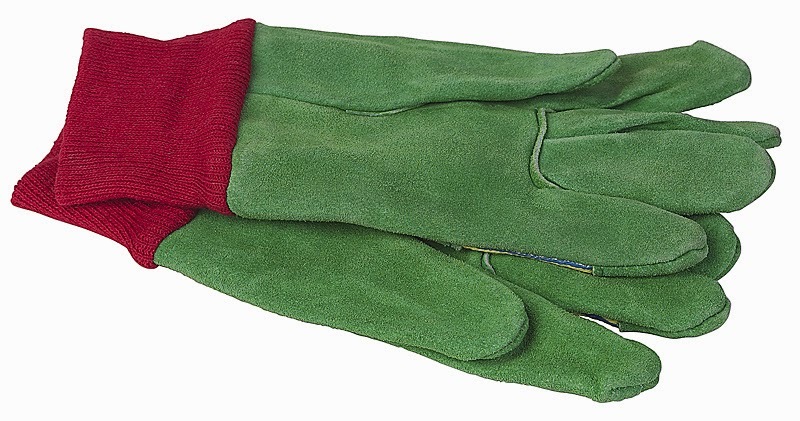 This brand is sold and services through both company stores and independent dealers. This company actively markets tires to the RV community is ST, LT and TBR type tires. They have a web site specially designed for RV owners with numerous links to pages with supporting technical information on "Tire Selection" and "Care & Maintenance". They have four videos featuring a now retires tire engineering friend of mine, Tim Miller as he explains various concepts of proper tire use and care in the RV market. I definitely recommend that everyone in the RV community watch these videos. If you want you can go directly to their Load & Inflation tables and learn about your tire capacity if you have this brand. This brand is sold and services through both company stores and independent dealers. This smaller tire company has a line of tires for RV application covering LT and TBR application. I find they have a number of heavy duty LR-G and LR-H tires in 16" and 17.5 diameter that may solve some heavy load issues that some RV owners seem to struggle with. These tires are sold through independent dealers and I could not find any company owned store information of on-line Load/Inflation information. Info from them indicated "Hercules Tire follows the guidelines published by The Tire and Rim Association. " so you can look at the tables used by Goodyear, Bridgestone, Firestone or Michelin. This is one of the two major tire companies that focus on the RV Motorhome market. 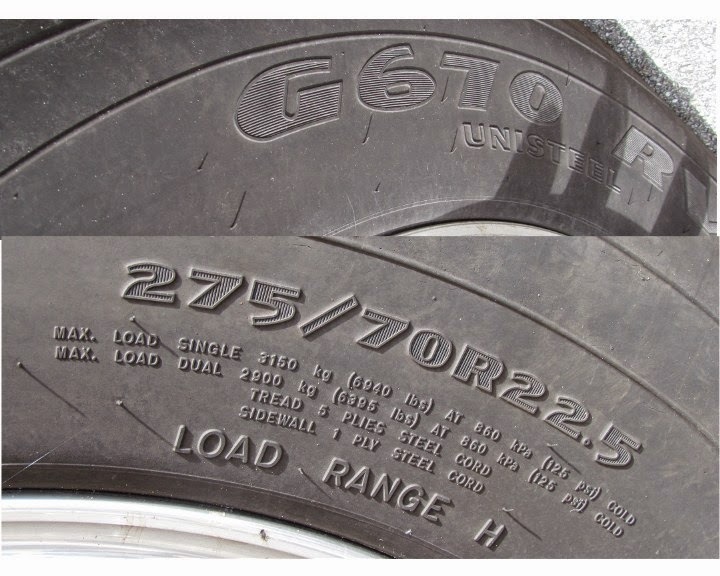 Their Load/Inflation numbers are sometimes confusing as they sometimes show the load for a axle rather than individual tires so it is very important that you read the numbers and table headings closely. Remember when selecting the inflation needed for your tires based on the actual load you need to select the loads on the heavier end of the axle. All tires on an axle should have the same inflation (i.e. based on heavier end) and you still need to add at least 10% to the minimum inflation specified for the load for your Motorhome. While most of the inflation ratings are the same as seen for Goodyear or Bridgestone there are a few exceptions so this is another example of you needing to confirm the ratings of the tires IN WRITING before you make your purchase. You can find general information on Michelin RV tires HERE. There are links to Load & Inflation tables HERE. Many of the smaller tire companies are in reality just "Private Brand" marketing companies. They do not design, engineer or manufacture tires themselves but simply place large volume orders from other manufacturers. 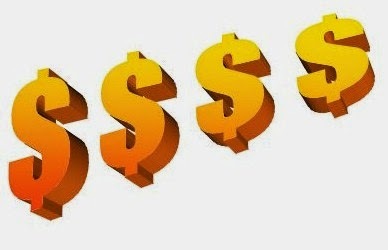 Many times these companies can offer lower prices since they do not have the overhead of design or testing staff and facilities but this means that if you are trying to get technical information form the company you may end up talking to a "customer service" person with no actual tire experience. They also do not have company stores so if you have a warranty claim you may have to return the tire to the location where you made your purchase or sometimes it will be your responsibility to ship a failed tire to some service location many states away. Private branding is just a marketing plan and is sometimes used by Major companies. Goodyear makes and sells Kelly brand tires. Firestone made Dayton brand. This is why it is important for you to read the DOT serial to learn who really made your tires. In some cases a marketing firm may have one size made by tire company ABC but a different size made by company XYZ. Other times the marketing firm might have 10,000 tires of a given brand and size made at one location but the next batch could be made at a completely different location or tire company. This "flexibility in manufacturing could man that the performance or reputation of a "brand" of tires may depend on which size or even what date of manufacturer we are talking about. Trailer Owners need to remember that they need to run the inflation on the tire sidewall to minimize the damage done whenever turning. You can refresh your understanding by reading THESE posts. For the most part you will find that brands not listed here will follow the US TRA published Load Inflation tables as used by Bridgestone, Firestone & Goodyear. BUT I have run into a few instances where the RV trailer assembler and the tire distributor "played games" and have adjusted the load capacity upward just enough to meet the legal requirements for the GAWR to be equal or less than the total capacity of the tires. These loads are not in the Industry Standards and means you are stuck with the size, LR and brand tires as supplied by the assembler or you will not be able to carry the load specified in the owners manual or on the placard affixed to your trailer. This is one major reason why you should ask to see the tables for your individual tires and compare them to the industry standards otherwise your tire replacement options will be limited to a single tire. I get asked this question quite a bit. I think that after reading various posts on tire inflation and load, some people want to complain a bit and are hoping to use the excuse that it is too much work to monitor tire pressure every travel day. "I've noticed that 50 psi cold at sea level at ambient 65F is 54-55F at 6,000 to 7,000 feet. While touring should I deflate to 50 psi cold at 7,000 feet if I'm hanging around there for a day or two?" 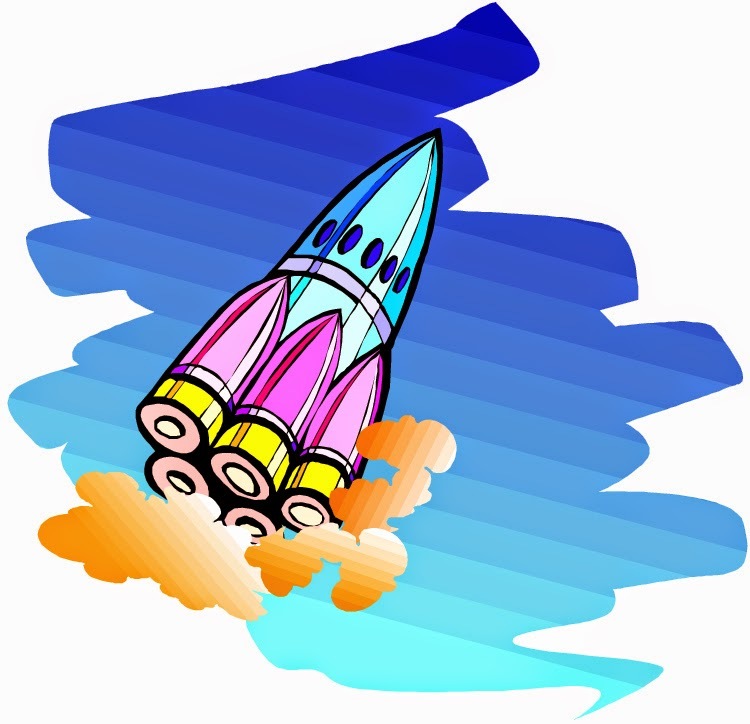 I am hoping that if I share my personal experience, it will provide a down to earth view on the topic that some want to turn into "Rocket Science"
I just finished a two-month cross-country trip. Ohio > Oregon > Seattle > Calgary, Canada > Yellowstone > Ohio in my Class-C MH with LT type tires that are 7 years old but have always been covered whenever parked for more than a couple of days, Always running inflation about 15 psi above what is needed for actual max load based on 4 position scale weights that are confirmed to have not changed significantly each year with a trip across CAT scales. Fastest I ever run is 70 mph but most of the 7,400 mile trip was with cruise set at 62mph. In other words, the tires have had a good life with good care. Elevation ranged from about 25' at Olympic Nat Park to 8,000'+ in Rockies. Morning temperature ranged from 33 F to 94 F. I have TPMS (both internal and external) so I am able to constantly monitor both pressure and temperature. I adjusted the tires once during the trip. I think I needed to add from 1 to 4 psi in the 6 tires. Since I run a nice inflation cushion of +25% I don't get all bent out of shape when the cold inflation is off by 3 to 5 psi from my goal. You don't have to make the task of monitoring inflation a big deal. While I may set my pressure to +/- 0.5 psi, you certainly don't need to be that fanatical, and I would consider it completely acceptable to be +/- 2% for the average user as long as the "goal" cold inflation has an appropriate safety margin. 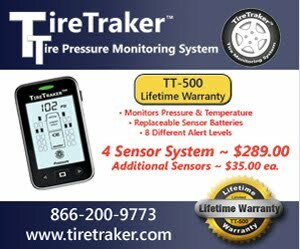 With TPMS I simply hit the button a couple times a day and get a real time reading of tire temperature and pressure. Yes, the temperatures vary and so do the pressures, but unless I see a sudden drop in pressure and there have been no external changes such as a sudden rainfall or one side constantly hotter than the other after spending hours with one side in full sun, I just do not worry about it. Relax. Let your TPMS monitor your tires and enjoy the scenery. I outlined that for the purpose of our discussion “Quality” meant "Conformance to a Performance Specification". We also looked at how different reviewers may have different expectations for the Quality or performance attributes of a set of tires. This time we will show how not all tires are intended to be of the same Quality since different applications and different customers have different objectives. The customer, and this does not mean the retail buyer but the company making the volume buying decision, establishes the performance specification and hopefully also establishes the relative importance for each evaluation point on the list of features in the specifications. 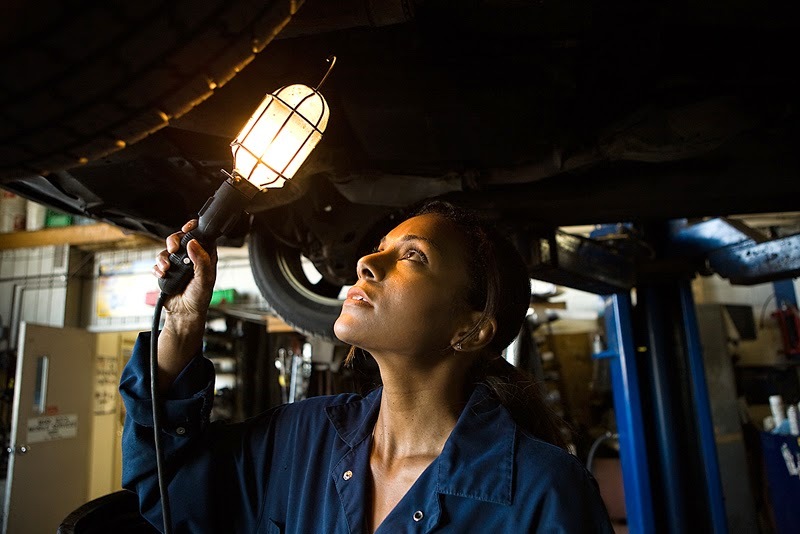 If the customer is a vehicle manufacturer they have in mind certain positioning in the market for their vehicle so they want tires that help them meet their sales and marketing goals. For cars this is easy to understand how handling is more important for some applications while mud traction is more important for others. Obviously the performance goals for a tire for a Corvette will be quite different than the performance specifications would be for a Jeep, but the consumer magazine made the erroneous assumption that all tires of the same size were designed with the same goals in mind and that the relative importance of those goals should have matched the personal preferences of the magazine test crew. I would suggest that they failed to consider that people contemplating the purchase of a set of tires might not have identical needs or expectations from a new set of tires. I will provide an example. Suppose you own a 5 year old pick-up and at 60,000 miles you got good wear from the first set of tires. You plan on keeping the truck for another 5 years and expect to drive a similar amount so you are looking for a set that delivers the lowest cost per mile as the "Best" option. But what if you only plan on keeping the truck for 9 months to a year? Why would you want to spend $800 on a set of tires when a $360 set will still have many miles left when you sell it. For a vast majority of people in the market for tires, the price is the most important feature they want or maybe that is all they can afford. Some tire dealers focus on the segment of the market that is price driven rather than performance driven so for them, low price is the Number One characteristic they specify when making purchase decisions while they say they will accept any performance for other characteristics or quite frankly just seem to not care. While meeting all regulatory tests is always a given, tire design engineers are sometimes challenged to rank low cost as their number one objective. To meet this goal of low cost, the engineer may select lower cost tread compound and trade off lower wet traction to get the lower cost compound. They might also design a narrower tread which needs less rubber and less steel (lower cost) at the sacrifice of wear and max handling. They might even design less tread depth to get lower cost while giving up some snow traction. So with cost maybe 55% lower that a top of the line performance tire they have clearly met the specification. How would this not be the better quality tire when the objectives are taken into consideration? In the real world if you can't sell the product, it doesn't make any difference how good someone, who is not making the decision to buy or not buy, thinks it is. In the RV market, where as far as I know there are no direct tire performance comparisons done by vehicle assemblers, be they for a 45' diesel pusher or a 13' pop-up trailer. I believe there may only be three criteria. Ability to carry a certain load (i.e. size & Load rating), tire availability and price. In some cases they may even ask the tire company to make a slight increase in load capacity to avoid having to buy a larger (more expensive) tire. Some tire companies with no retail presence in the US market and knowing they will not be confronted with the cost of adjusting the tires because they offer no or very short warranty are willing to "tweak" the claimed load capacity so they can make the sale even if the load capacity is outside established industry standards and it makes finding an appropriate replacement tire a significant problem for owners of the RV or it actually results in lower long term durability. After all if you can make the sale of a few thousand tires and know full well you will never have to address the cost associated with adjusting or replacing a failed tire why worry? Sometimes the ability of certain tires to meet some expected level of performance creates misleading ratings. In one case I recall, a tire was rated both exceeds expectations and fails to meet expectations. The fact is the same tire was applied to both a Luxury vehicle and a base model from the same vehicle manufacturer. The issue was that the end user, who was doing the evaluation, had different expectations based on the luxury level of the car so rated the tires on the Luxury car better than the tires on the base vehicle despite the fact that the tires were identical. So what value was that customer rating for people making a buying decision? After reading this I hope you can understand the problems associated with using a magazine review as a reasonable method of learning the quality of a product. I also hope that you understand that getting a proper reading on real quality of any given tire will require that you do some homework and ask probing questions. I hope by now you understand the problem with talking in general terms about "Quality". Also that the quality of one specific product made or sold by a company may or may not reflect the quality of other products they sell. Reading reviews on "Tire Quality" has always been a hot button issue for me as I can quickly see that those doing the evaluation seem to not have a clue of how or why certain tires are designed for certain applications or to different objectives. I will also offer a suggestion that when buying your next set of tires or RV you request a minimum of four year warranty on manufacturing defects and a three year Road Hazard Warranty. The Road Hazard Warranty will avoid disagreement on what caused the failure in the first place. 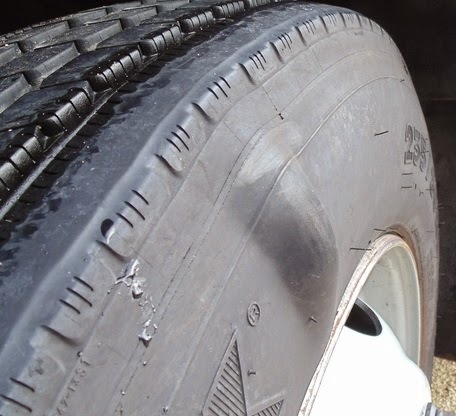 I would also suggest that if if you are buying a set of tires it would make your case stronger if you are able to present weight slips showing your RV is not overloaded. Now this will cost you a few dollars more per tire (maybe 15%) but I would wager that some tire or RV retailers will simply refuse to offer such a warranty. Could their refusal be based on their knowledge that the tires or RVs they are selling have a high probability of suffering some sort of failure during the first few years of use? Maybe the dealers know the real quality of the products they are selling. I know of at least on large tire chain that is happy to offer an extended warranty of their tires but the fine print excludes RV use. Have to wonder why. Should you reduce pressure when driving on "Hot" Roads? I got this question and thought that others might be wondering about the same topic. increase the pressure and I am afraid of damaging my tires. No you don't have to worry about hot roads. Now you didn't say if you have a standard RV trailer or a Motorhome so I will give you a summary for each application. 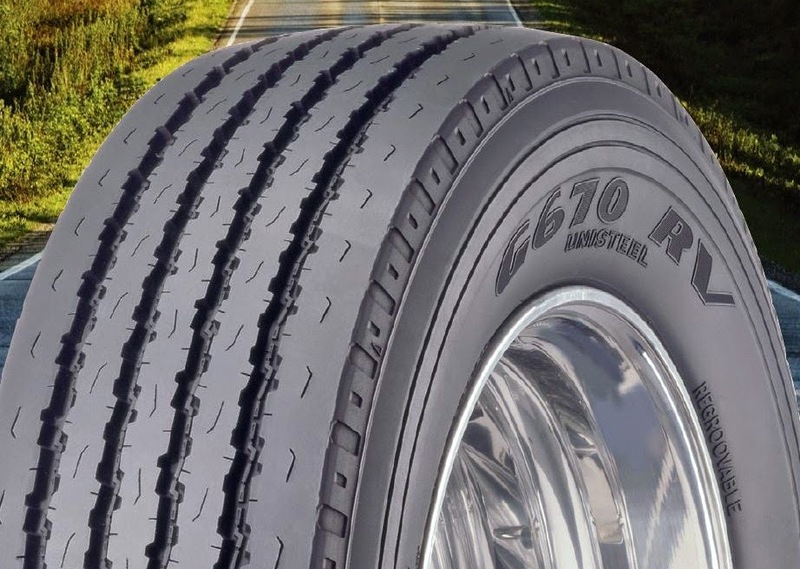 Trailers: You should set the Cold Inflation to the pressure on the tire sidewall. If you look at the sticker on the side of your trailer you should find the tire size, type, Load Range and pressure recommendation from the manufacturer. 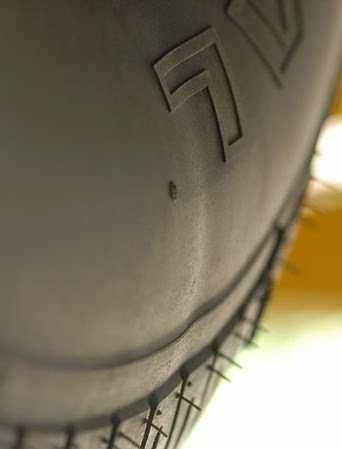 In almost all cases the recommended inflation is the inflation on the sidewall of the tires. Have you confirmed you are not overloading any of your tires? Simply guessing or looking at the tires is not good enough you need to get the trailer on a scale and at a minimum get the total load on the tires. Now you can't assume the load is equally distributed side to side or axle to axle Measurements of thousands of trailers suggests you need to assume at least 53/47 to 55/45 split axle to axle and split side to side so you need to calculate the heaviest load based on an estimate of 27% to 30% of the total being on one of the 4 tires. A better method is to get individual tire loading. You can learn more HERE. Motorhomes are a bit different than towables. Here you need to get the "corner" loading as the side to side difference is affected by the placement of things like generator, water tanks, refrigerators etc. The Front Rear loading is obviously different and for most motorhomes the number of tires on each axle is also different. You can use the information on your placard but a better method is to get the actual tire loading and then using Load/Inflation charts establish the MINIMUM cold inflation then add 10% to get your Cold Set inflation. THIS post has some info and a link in it. When tires are designed, we know that some vehicles will be driven on hot roads. Tires will normally run +20°F to +50° above ambient. You should run a TPMS to get warning of air leak due to puncture. If you are driving in the USA you should have no problems. Most TPMS also have a high temperature warning that is set for 155°F to 160°F. If you get a warning at this temp but the pressure is above your set pressure by about 10%, simply slowing down should lower the temperature. If that doesn't work you can still stop for 10 minutes while you do a walk around to be sure nothing unusuall is going on. If you are traveling to Saudi Arabia, the Sahara or Australian outback then we need to take some additional steps and precautions. Got a question I have never heard before but thought I would share it and the answer with you as there is some safety related information to be gained. Just met an RV owner who was told by a Discount Tire salesperson that it was too dangerous for anyone to add air to a tire that was on the coach, as the risk was too great. Apparently, from the rim or the tire exploding. Even they weren't allowed to add air unless the tire was in a cage. Having to take the vehicle to a service center every time one needs air sure won't promote maintaining proper inflation. Is it ok for the owner to check and maintain proper pressure, regardless of the tire size? 2. You should also use a cage when re-inflating any tire that had been run flat or suffered a puncture and lost more than 20% of its air. Basically running a tire when low by 20% or more, can damage the body cord. 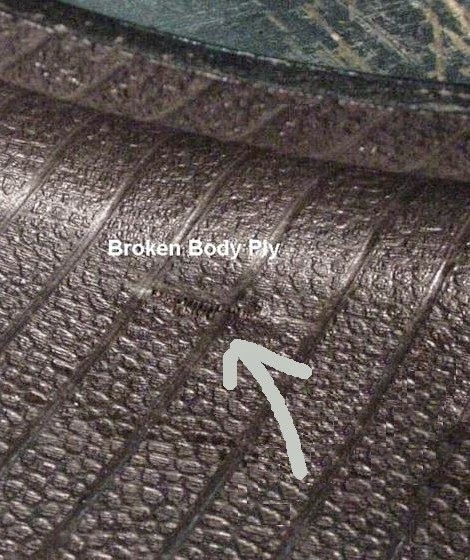 On tires with steel body cord such as most Class-A type this can result in broken body cord which can result in an explosion when the tire is inflated. Tires damaged due to puncture should also be re-inflated in a cage. I think the salesperson at the tire store misunderstood some of his training. My suggestion is to ask to speak to a manager. If you get the same advice on always using a cage when adding a few psi to a tire then I suggest you find a different tire dealer. I do mention the use of a cage in this post. I have contacted Discount tire but have not heard back yet. I believe the salesperson has some of their training information mixed up as I know of no regulation or even suggestion that simply adding a few psi to a tire that is already mounted and almost fully inflated needs to be done in a safety cage. For those not sure what an Inflation Cage looks like or what it does here is a short video from Ken-Tool doing an OSHA test. One final comment. I did once receive a passenger tire for inspection that had exploded after being repaired. In this case the tech had damaged the tire when dismounting it. This is why I suggest that a safety cage or at least some type of restraint be used when re-inflating from 0 psi after a repair.